Participants in the Quantico Tri and 12K are required to pick up bib, timing tag and other event materials prior to event day. To facilitate the pick up runners must show the E-card, either printed out or displayed on phone. Packet pick-up will be conducted on Friday, August 24 from 7:30 a.m. to 7:00 p.m at Fowler Hall, the MCM headquarters building, located aboard Marine Corps Base Quantico. Bibs, timing chips, helmet stickers, bike numbers and competitor tattoos will be distributed at this time. Timing chips must be returned at the completion of the event. Runners are encouraged to attend Packet Pick-up prior to event day. There will be limited event morning Packet Pick-up available at the event site beginning at 5:00 a.m. Runners must bring the official E-Card to Packet Pick-up. E-cards will be emailed prior to Packet Pick-up. Extended wait times to obtain a packet on event morning could delay participation in Quantico Tri. Conte’s is a family owned and operated bicycle shop, headquartered in Virginia, dedicated to providing personal service and top quality cycling product. Established in 1957, with locations throughout the state and Washington, D.C. area, Conte’s proudly provides the same legendary cycling goods and services for all brands of bicycles. Conte’s will be at MCM World HQ during Packet Pickup on August 24 from 12:00 p.m. – 7:00 p.m. Athletes may bring bikes for repair or tune ups as needed before event day. The individual picking up the bib for a registered runner must present a hard copy of the completed E-card with a copy of the runner's photo ID, as well as a copy of his/her ID. E-Cards are emailed to the registered runner before the event. Parents may sign waiver and retrieve packets for their children under 18 years of age. Marine Corps Marathon World HQ (MCMWHQ): Fowler Hall, Quantico, VA. If using a GPS, enter 3500 Russell Road, Quantico, VA.
Exit 150 from I95: From North, pass the National Museum of the Marine Corps on your right and cross Route 1 to reach security gate. Be prepared to show photo ID. Make a right turn onto Purvis Road. Road curves around the Marine Corps Exchange. At the light, turn right onto Russell Road. Turn right into the MCM lot, after the Commissary and Exchange. MCMWHQ is the last building on the right. Hint: If reach the guard station, you've gone too far. 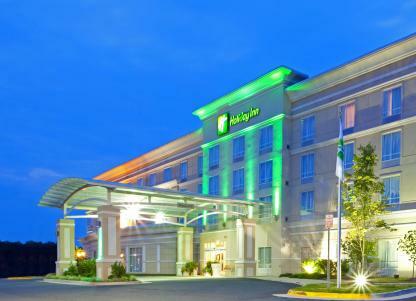 Minutes away from Marine Corps Base Quantico and the Quantico Tri course, the Holiday Inn Quantico Center is dedicated to help make runners' stay unforgettable. Finishers receive a stunning medal. Award ceremonies for top finishers and age award winners will be held on event morning near the finish line.